Some cancer patients and their insurers are seeing their bills for chemotherapy jump sharply, reflecting increased drug prices and hospitals’ push to buy oncologists’ practices and then bill at higher rates. Patients say, “‘I’ve been treated with Herceptin for breast cancer for several years and it was always $5,000 for the drug and suddenly it’s $16,000 — and I was in the same room with the same doctor same nurse and the same length of time’,” said Dr. Donald Fischer, chief medical officer for Highmark, the largest health plan in Pennsylvania. Like other insurers, Highmark found that when hospital systems bought doctors’ practices, chemotherapy costs rose because physicians’ offices were then deemed “hospital outpatient centers” and could charge more for overhead. Now insurers are pushing back. In what may be the first move of its kind, Highmark in April stopped paying higher fees for chemotherapy drugs given to patients whose doctors work for hospitals, instead paying the same price they would have had the doctor remained independent. The move is being watched closely by insurers around the country, and “some will probably follow suit,” said Kathryn Fitch, a healthcare management consultant at Milliman, whose 2013 study documented chemotherapy costs in hospital outpatient settings ran as much as 53 percent higher than in doctors’ offices. “The pendulum has swung toward hospitals buying up physician practices to get better revenue,” Fitch said. Other insurers are trying different ways to hold down costs. WellPoint, one of the nation’s largest insurers, will soon begin paying oncologists a bonus of $350 a month per patient for sticking with specific, less-costly, chemotherapy regimens. Florida Blue has partnered with some doctor practices to create cancer-specific “accountable care organizations” that reward doctors if the new organizations save money while hitting quality targets. And UnitedHealthcare, the biggest insurer by market share, is expanding a pilot project that uses flat, or “bundled,” payments for the treatment of certain cancers – which include the cost of drugs. Changing the way cancer care is paid for is a top priority for insurers and employers, with treatments costing the U.S. more than $127 billion each year. That is projected to grow 27 percent from 2010 to 2020 as the population ages, said epidemiologist Robin Yabroff at the National Cancer Institute. Meanwhile, the average monthly cost of a brand-name cancer drug has doubled to $10,000 in the past decade, according to a May report from the IMS Institute for Healthcare Informatics. That’s important because the traditional way to pay for cancer drugs given in a doctor’s office is to reimburse the physician for the average sales price of the drug, plus an added percentage to cover overhead and a de facto profit margin. In Medicare, for instance, the added percentage is 6 percent. Highmark’s Fischer and others say that payment method creates an incentive to use higher-priced drugs — and more of them. “If you give a 10,000 drug, it’s $600 [for the doctor]. If you give a $100 drug, you get a margin of $6,” said Fischer. He said that such “buy and bill” programs are being phased out in other specialties, but have continued in cancer care because insurers fear losing oncologists from their networks. 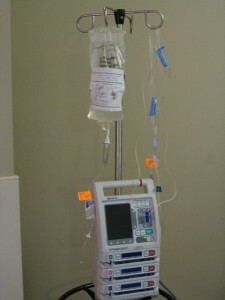 Administering chemotherapy in hospital outpatient settings is even more expensive, studies show. IMS Health reported that per-dose payments were 189 percent higher for brand-name drugs given in hospital outpatient settings than in independent doctor offices. Some of that added burden falls on patients, who paid $134 more per dose on average for cancer drugs given in hospital outpatient settings than in doctors’ offices, the report found. While the health law limits annual out-of-pocket costs to $6,350 for individuals and $12,700 for families, paying such sums out of pocket is daunting for many consumers. Studies of breast cancer patients show that even small increases in copayments led some to stop treatment. The problem is likely to grow as more physician practices are purchased by hospitals. In a recent six-month period, for example, Medicare payments tripled for chemotherapy in hospital outpatient settings and dropped 14 percent in doctors’ offices. In March, the advisory group MedPac recommended that Medicare reduce or eliminate differences in payment rates between outpatient departments and physician offices for many services. As more attention focuses on costs, the drug industry has fired back, concerned that standardized regimens will discourage the innovation that it says has led to better survival rates. Such drug regimens or bundled payments could “create significant barriers and disincentives toward continued innovation,” said Randy Burkholder, vice president of policy at the Pharmaceutical Research and Manufacturers of America, the industry’s lobbying arm. Some physicians also reject a one-size-fits-most approach, concerned about impact on quality. Insurers insist they can lower cost without hurting quality or innovation. Wellpoint, for instance, said it expects to save at least 3 percent on overall cancer costs through its plan to give bonuses to doctors who follow specified treatment regimens, or “pathways.” Such regimens are based on analyses of effectiveness and costs by private firms, such as U.S. Oncology, or by insurers’ themselves. To date, evidence of savings is inconclusive. Some insurers have reported significant savings, while others have not, said Lindsay Conway, practice manager at the Advisory Board Company, a consulting firm that works with hospitals. Despite their own cost concerns, patient groups also express misgivings about standardized drug regimens and flat payments, fearing they may encourage providers “to make treatment decisions based on cost and less on the evidence,” Rosen said.